Nov. 15, 2018, 8:48 a.m.
By Francesco Marconi and Till Daldrup Nov. 15, 2018, 8:48 a.m. Artificial intelligence is fueling the next phase of misinformation. The new type of synthetic media known as deepfakes poses major challenges for newsrooms when it comes to verification. This content is indeed difficult to track: Can you tell which of the images below is a fake? We at The Wall Street Journal are taking this threat seriously and have launched an internal deepfakes task force led by the Ethics & Standards and the Research & Development teams. This group, the WSJ Media Forensics Committee, is comprised of video, photo, visuals, research, platform, and news editors who have been trained in deepfake detection. Beyond this core effort, we’re hosting training seminars with reporters, developing newsroom guides, and collaborating with academic institutions such as Cornell Tech to identify ways technology can be used to combat this problem. Here’s an overview for journalists of the insights we’ve gained and the practices we’re using around deepfakes. How are most deepfakes created? The production of most deepfakes is based on a machine learning technique called “generative adversarial networks,” or GANs. This approach can be used by forgers to swap the faces of two people — for example, those of a politician and an actor. The algorithm looks for instances where both individuals showcase similar expressions and facial positioning. In the background, artificial intelligence algorithms are looking for the best match to juxtapose both faces. Because research about GANs and other approaches to machine learning is publicly available, the ability to generate deepfakes is spreading. Open source software already enables anyone with some technical knowledge and a powerful-enough graphics card to create a deepfake. Some academic institutions such as New York University are taking unique approaches to media literacy. One class at the Interactive Telecommunications Program (ITP) at NYU Tisch — “Faking the News” — exposes students to the dangers of deepfakes by teaching them how to forge content using AI techniques. “Studying this technology helps us not only understand the potential implications but also the limitations,” said Chloe Marten, a product manager at Dow Jones and master’s candidate who enrolled in the NYU class. Faceswap: An algorithm can seamlessly insert the face of a person into a target video. This technique could be used to place a person’s face on an actor’s body and put them in situations that they were never really in. Lip sync: Forgers can graft a lip-syncing mouth onto someone else’s face. Combining the footage with new audio could make it look like they are saying things they are not. Facial reenactment: Forgers can transfer facial expressions from one person into another video. With this technique, researchers can toy with a person’s appearance and make them seem disgusted, angry, or surprised. Motion transfer: Researchers have also discovered how to transfer the body movements of a person in a source video to a person in a target video. For instance, they can capture the motions of a dancer and make target actors move in the same way. In collaboration with researchers at the University of California, Berkeley, Journal correspondent Jason Bellini tried this technique out for himself and ended up dancing like Bruno Mars. Journalists have an important role in informing the public about the dangers and challenges of artificial intelligence technology. Reporting on these issues is a way to raise awareness and inform the public. From “Deepfake Videos Are Getting Real and That’s a Problem,” The Wall Street Journal, October 15, 2018. We’re working on solutions and testing new tools that can help detect or prevent forged media. Across the industry, news organizations can consider multiple approaches to help authenticate media if they suspect alterations. If someone has sent in suspicious footage, a good first step is to try to contact the source. How did that person obtain it? Where and when was it filmed? Getting as much information as possible, asking for further proof of the claims, and then verifying is key. If the video is online and the uploader is unknown, other questions are worth exploring: Who allegedly filmed the footage? Who published and shared it, and with whom? Checking the metadata of the video or image with tools like InVID or other metadata viewers can provide answers. In addition to going through this process internally, we collaborate with content verification organizations such as Storyful and the Associated Press. This is a fast-moving landscape with emerging solutions appearing regularly in the market. For example, new tools including TruePic and Serelay use blockchain to authenticate photos. Regardless of the technology used, the humans in the newsroom are at the center of the process. Deepfakes are often based on footage that is already available online. Reverse image search engines like Tineye or Google Image Search are useful to find possible older versions of the video to suss out whether an aspect of it was manipulated. Editing programs like Final Cut enable journalists to slow footage down, zoom the image, and look at it frame by frame or pause multiple times. This helps reveal obvious glitches: glimmering and fuzziness around the mouth or face, unnatural lighting or movements, and differences between skin tones are telltale signs of a deepfake. As an experiment, here are some glitches the Journal’s forensics team found during a training session using footage of Barack Obama created by video producers at BuzzFeed. 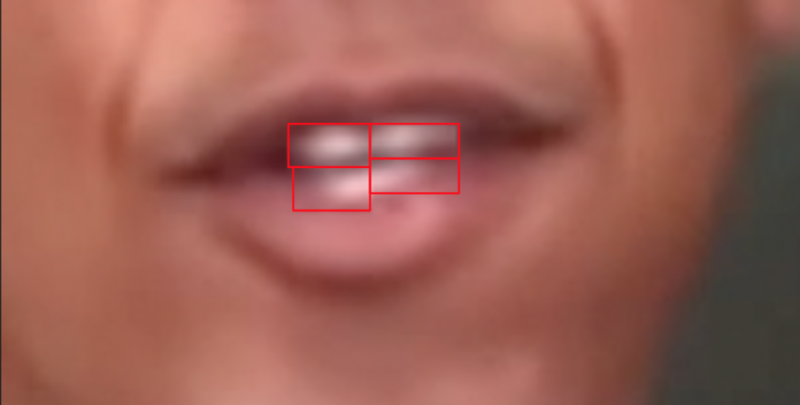 The box-like shapes around the teeth reveal that this is a picture stitched onto the original footage. Unnatural movements like a shifting chin and growing neck show that the footage is faked. In addition to these facial details, there might also be small edits in the foreground or background of the footage. Does it seem like an object was inserted or deleted into a scene that might change the context of the video (e.g. a weapon, a symbol, a person, etc.)? Again, glimmering, fuzziness, and unnatural light can be indicators of faked footage. In the case of audio, watch out for unnatural intonation, irregular breathing, metallic sounding voices, and obvious edits. These are all hints that the audio may have been generated by artificial intelligence. However, it’s important to note that image artifacts, glitches, and imperfections can also be introduced by video compression. That’s why it is sometimes hard to conclusively determine whether a video has been forged or not. Adobe is working on Project Cloak, an experimental tool for object removal in video, which makes it easy for users to take people or other details out of the footage. The product could be helpful in motion picture editing. But some experts think that micro-edits like these — the removal of small details in a video — might be even more dangerous than blatant fakes since they are harder to spot. There are algorithms for image translation that enable users to alter the weather or time of day in a video, like this example developed by chip manufacturer Nvidia by using generative adversarial networks. These algorithms could be used for post-production of movie scenes shot during days with different weather. But this could be problematic for newsrooms and others, because in order to verify footage and narrow down when videos were filmed, it is common to examine the time of day, weather, position of the sun, and other indicators for clues to inconsistencies. Both Adobe and Nvidia declined to comment. Audio files can also be manipulated automatically: One company, Lyrebird, creates artificial voices based on audio samples of real people. One minute of audio recordings is enough to generate an entire digital replica that can say any sentence the user types into the system. Applications of this technology include allowing video game developers to add voices to characters. Off-the-shelf consumer tools that make video and audio manipulation easier may hasten the proliferation of deepfakes. Some of the companies behind these tools are already considering safeguards to prevent misuse of their tech. “We are exploring different directions including crypto-watermarking techniques, new communication protocols, as well developing partnerships with academia to work on security and authentication,” said Alexandre de Brébisson, CEO and cofounder of Lyrebird. While these techniques can be used to significantly lower costs of movie, gaming, and entertainment production, they represent a risk for news media as well as society more broadly. For example, fake videos could place politicians in meetings with foreign agents or even show soldiers committing crimes against civilians. False audio could make it seem like government officials are privately planning attacks against other nations. Lawmakers like senators Mark Warner and Marco Rubio are already warning of scenarios like these and working on possible strategies to avoid them. What’s more, deepfakes could be used to deceive news organizations and undermine their trustworthiness. Publishing an unverified fake video in a news story could stain a newsroom’s reputation and ultimately lead to citizens further losing trust in media institutions. Another danger for journalists: personal deepfake attacks showing news professionals in compromising situations or altering facts — again aimed at discrediting or intimidating them. As deepfakes make their way into social media, their spread will likely follow the same pattern as other fake news stories. In a MIT study investigating the diffusion of false content on Twitter published between 2006 and 2017, researchers found that “falsehood diffused significantly farther, faster, deeper, and more broadly than truth in all categories of information.” False stories were 70 percent more likely to be retweeted than the truth and reached 1,500 people six times more quickly than accurate articles. Deepfakes are not going away anytime soon. It’s safe to say that these elaborate forgeries will make verifying media harder, and this challenge could become more difficult over time. “We have seen this rapid rise in deep learning technology and the question is: Is that going to keep going, or is it plateauing? What’s going to happen next?” said Hany Farid, a photo-forensics expert, who will join the University of California, Berkeley faculty next year. He said the next 18 months will be critical: “I do think that the issues are coming to a head,” adding that he expects researchers will have made advances before the 2020 election cycle. Despite the current uncertainty, newsrooms can and should follow the evolution of this threat by conducting research, by partnering with academic institutions, and by training their journalists how to leverage new tools. And here’s the solution to our deepfake quiz above: The footage on the left was altered with the help of AI. Francesco Marconi is R&D chief at The Wall Street Journal. Till Daldrup is a research fellow at the Journal and a master’s candidate at NYU’s Studio 20 journalism program. POSTED Nov. 15, 2018, 8:48 a.m.
Marconi and Till Daldrup, Francesco. "How The Wall Street Journal is preparing its journalists to detect deepfakes." Nieman Journalism Lab. Nieman Foundation for Journalism at Harvard, 15 Nov. 2018. Web. 24 Apr. 2019. Marconi and Till Daldrup, Francesco. "How The Wall Street Journal is preparing its journalists to detect deepfakes." Nieman Journalism Lab. Last modified November 15, 2018. Accessed April 24, 2019. https://www.niemanlab.org/2018/11/how-the-wall-street-journal-is-preparing-its-journalists-to-detect-deepfakes/.